Thick-billed murre Uria lomvia, photographed by Allan & Elaine Wilson. 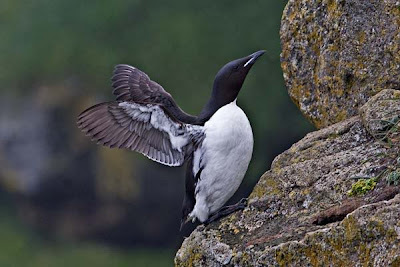 The Alcidae include the auks, murres (or guillemots) and puffins. Alcids are heavy-bodied marine birds with legs placed far back on the body that use their wings to propel themselves when diving. Members of the family are found in the Arctic and north temperate regions. [R76] Ray, C. E. 1976. Fossil marine mammals of Oregon. Systematic Zoology 25 (4): 420-436.